Falafels need a makeover. Somehow, this once healthy alternative to the burger and pizza slice has now become the greasy staple of drunken teenagers everywhere. And although it’s probably a better choice than typical fast food (especially for vegetarians) it’s just junky health food not healthy junk food. This amazing recipe transforms your run-of-the-mill wrap into a tasty treat with an unexpected twist. Sweet potatoes take center stage as the base, in place of the standard chickpeas and fava beans (which, mind you, are excellent healthy food choices until you deep fry them in questionable, oxidized oil). These falafel balls are also baked, keeping the fat content low for those watching their waistlines. Even thought they are super healthy, my taste-testers swore they were just as good (or bad?) as junk food! The other wonderful thing about this recipe is the chickpea flour content. If you scroll back a few articles, you’ll find the instructions needed to grind your very own flour from any grain or legume, including chickpeas. This is especially helpful since chickpea flour can be both difficult to find and very pricey. As an excellent source of vitamin A (in the form of beta-carotene) and a very good source of vitamin C, sweet potatoes have healing properties as an antioxidant food. Both beta-carotene and vitamin C are very powerful antioxidants that work in the body to eliminate free radicals. Free radicals are chemicals that damage cells and cell membranes and are associated with the development of conditions like atherosclerosis, diabetic heart disease, and colon cancer. This may explain why beta-carotene and vitamin C have both been shown to be helpful for preventing these conditions. Since these nutrients are also anti-inflammatory, they can be helpful in reducing the severity of conditions where inflammation plays a role, such as asthma, osteoarthritis, and rheumatoid arthritis. 1. Preheat the oven to 425F degrees (220C) and roast the sweet potatoes whole until just tender – 30 minutes to 1 hour (depending on size). Turn off the oven, leave the potatoes to cool, then peel. 2. Make the chickpea flour by putting about 1 ½ cups of dried chickpeas into your blender and grind on high for a few minutes until the flour stops falling into the middle of the container (you will understand this once you do it). Pour blender contents out into a fine-mesh sieve and sift until the fine gram and coarse legume bits are separated. You should have just less than 1 cup of fine chickpea flour – if not, make more. 3. Put the sweet potatoes, cumin, garlic, ground and fresh coriander, lemon juice and chickpea flour into a large bowl. Season well, and mash until smooth with no large chunks. Stick in the fridge to firm up for an hour, or the freezer for 20-30 minutes. When you take it out, your mix should be sticky rather than really wet. You can add a tablespoon or so more of chickpea flour if necessary (the water content of sweet potatoes varies enormously). 4. Reheat the oven to 400F/200C. Using a couple of soup spoons (put a well-heaped spoonful of mix in one spoon and use the concave side of the other to shape the sides) or a falafel scoop if you have one, make the mixture into falafel-y looking things and put them on a tray lined with parchment paper. Sprinkle sesame seeds on top and bake in the oven for around 15 minutes, until the bases are golden brown. 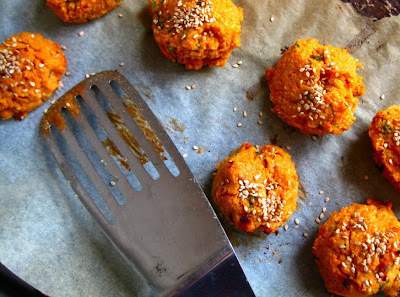 Tip: next time I make these (which will certainly be very soon) I plan on rolling the falafel balls in the sesame seeds to coat them entirely. This will add extra crunch and flavour. To serve your falafel balls the traditional, meal-on-the-go kind of way, you can wrap them up in a whole grain tortilla or pita. Load it with lettuce, tomato, cucumber, avocado, sprouts and drizzle on some yummy tahini sauce (recipe below). Alternatively, you can plate them on top of salad greens, with brown rice or cous cous on the side. Again, drizzle the whole plate with the tahini dressing – it’s delicious! 1. Combine all ingredients in a medium-sized bowl. Using a whisk beat briskly into a smooth sauce. This takes about 1 to 2 full minutes of beating (you can also use a hand-blender). This sauce can be served at room temperature or chilled. Refrigerate leftovers. Keeps well for 5 to 7 days. Makes 1 1/2 cups (360 ml). 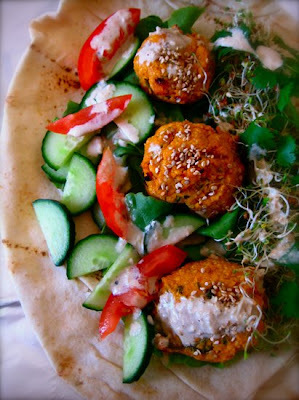 The recipe for the falafels makes a lot, so refrigerate them overnight and pack them in a picnic lunch for the next day! They will firm up as they cool down too, making them even more like the traditional falafel balls you get at restaurants. Healthy junk food, here we come! Pingback: "Bolitas" de boniato y lentejas rojas con salsa de anacardos - Es fácil… ¡si sabes cómo! These were incredibly tasty Sarah! My first time making this recipe but I’ve made quite a few of your recipes and they always exceed expectations. My partner loved this as a surprise at the end of a long day of studying and working. I’m wondering if you think these could be made with some kind of winter squash instead of sweet potato — I have an abundance of pumpkin, delicata, acorn, kabocha, and sweetmeat. Well, I tried this recipe with sweetmeat squash — delicious!! You really should give credit for this recipe–it is not your creation. you have copied it more or less verbatim from their cookbook: http://www.amazon.com/exec/obidos/ASIN/1840915021/heidiswanson-20 . Heidi Swanson (101 cookbooks) posted the same recipe on her blog BUT gave credit. I am sure you would not want people to post recipes from your new book and claim that they developed them! Made these last night and they were delicious! Question: is there a good way to use the leftover chunks of dried chickpea (i.e. after sifting)? Made these last night and they were delicious! Question: can the leftover chunks of dried chick peas (that were sifted) be used for anything? definitely an oddity. –LINK REMOVED –>Grammy Nominations 2011<. Just as your swelling falls a bit responding on the diuretic doesn't imply you are receiving better. website link on your ppage at appropriate plac aand other perso will also do similar for you. I just made these and they were loved by all my family. Will definitely be making them again! Thank you! Hey Sarah, these were SO good! Thank you for reinventing the falafel. And if you’re looking for chickpea flour you can get it at any Indian store. Look for ‘Besan’ – that’s chickpea flour and not too expensive. Wow! Made these tonight they were awesome. I rolled the balls a bit smaller than in the photo and I think this helped with consistency. Thank you for sharing such a delicious and healthy meal. surface, but which have been abandoned for want of capital. Finding the Venus reef abandoned he went towards the Four Mile, two miles distant, and located about fourteen Chinamen camped there. Sarah – These are wonderful. I have made them several times, but I want to make them a few days ahead this time. Would you suggest storing the cooked falafels in the fridge or freezer? I’ve been following your blog for some time now, and I have to say that I really LOVE how the recipes turn out! Every time I make a new recipe from here, it ends up in my ‘Favorite Recipes’ folder. I just made these the other night with a zucchini, kale and onion saute in lieu of the veggies you used, and I added feta…delightful! 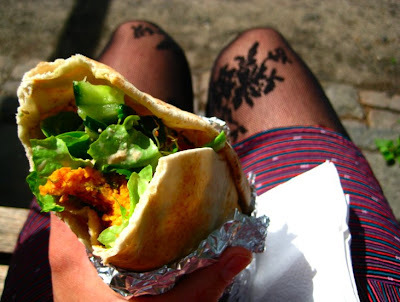 Also, it’s a bit off topic, but I’ve been looking for a pair of tights like the ones in the photo of the finished falafel pita. I would LOVE to know where to find them, though I realize there’s a good chance that they’re no longer available. Thanks in advance, and keep doing what you’re doing…it’s wonderful! I made these last night and they were a huge hit with my junk food loving, albeit picky eater of a boyfriend! Thank you for such fantastic healthy recipes! I have some of these in the fridge, shop bought, but now I’ve found a recipe to make them fresh. I love the versatility of a falafel. I shared this recipe on my latest meal plan as a side suggestion at RainbowDelicious.com. Thank you! I agree about the I fermented soy for sure! But am also curious if another flour can be used. I have coconut and sorghum and a little rice flour. Is there any specific reason you used what you did? I am GF so i appreciate it wasn’t wheat flour. Sounds delicious! I enjoyed this for dinner tonight and rolled the falafel entirely in sesame seeds. Great touch. Hi Sarah, is there going to be any follow up on the soya topic? I’d really like to know what you have to say about it. greetings. I will definitely be trying these! I have made baked falafels with chickpeas before and my fiance was not crazy for them, he does love sweet potatoes though so hopefully they will be a hit! Thank you for a lovely recipe! please please please tell me you have a recipe book or are in the process of writing one!! these look AMAZING! These look great! I have some sweet potatoes that I wasn’t quite sure what to do with – I can’t wait to try this! Oh right, I forgot you wrote me before! I have cut out non-fermented soy products from my diet. I do not think it’s good for us! A long story and a whole post’s worth of info….someday I will explain! Hi Olga – I have not mentioned soya flour in this post to my knowledge. What are you referring to? I am little bit surprised about soya flour health perspective… Could you please tell more about what you mean? Sure, you could use soya flour if it’s what you have on hand, but I wouldn’t recommend it from a health perspective. This looks great and I’m cooking it right now — falaffel is in the oven. I just wanted to ask if it’s possible to use soja flour instead of chickpea flour? These were yum, was led here via krim krams, and last night decided to take a stab at these for a Tron party I had. Meat eaters, vegans, vegetarians – all in attendance were able to eat to satisfaction and were still texting me up til today about how yum these were! What a great recipe, adding this to the rolodex for future use! Hooray! You are a wizard, Sarah! There are a million and one greasy falafel stops in Abu Dhabi/Dubai. You never quite know what goes into them, and if you ever want to enjoy them, you are forced to turn a blind eye to the oil content in these little nuggets of sin. You have finally created one which combines an all-time favourite (sweet potatoes) with the goodness of baking. I added some sesame oil (for an added nutty hit) and a little cayenne to spice them up a little. They are resting in the fridge now, but I will shamefully admit that I went ahead and sampled the batter. I can tell you now that a love affair has begun. Will pass them around to a few of my Arab friends (aka falafel connoisseurs) and let you know the verdict! This looks really good Sarah!